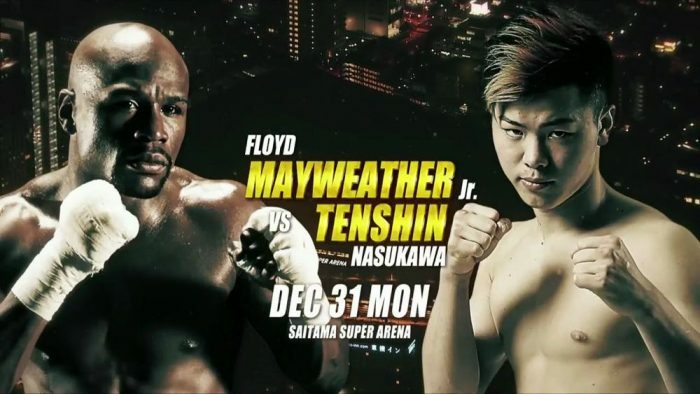 Floyd Mayweather will come out of retirement yet again but this time he’s traveling to Japan to take on 20-year old kickboxing sensation Tenshin Nasukawa in RIZIN on Dec. 31. The surprise announcement was made late Sunday night during a press conference where Mayweather appeared alongside Nasukawa in Japan. What is unknown at this time is what rule set or weight class the fight will be held under but Mayweather vs. Nasukawa is now scheduled for New Year’s Eve at the Saitama Super Arena in Saitama, Japan. “I’m pretty sure he’s going to bring a lot of excitement. I’m going to bring a lot of excitement,” Mayweather said at the press conference where the fight was announced. “That’s really want the people want to see. Mayweather last competed in 2017 when he earned a 10th round TKO against former two division UFC champion Conor McGregor. Afterwards, Mayweather retired at 50-0 as a boxer but now he’s coming back, although it’s unclear on the rules that he’ll compete under when he faces Nasukawa in Japan. “We’ll talk about that, we’ll get that situated within the next couple weeks,” Mayweather said about the rules and weight class for the fight. It’s a bizarre and unexpected turn of events with Mayweather deciding to fight again but opting to compete in Japan for an organization like RIZIN, which is predominantly a mixed martial arts promotion. As for his opponent, Nasukawa is 27-0 as a kickboxer with 21 knockouts while also holding a perfect 4-0 record as a mixed martial artist. Most recently, Nasukawa dispatched former UFC flyweight Kyoji Horiguchi in a kickboxing bout in September. Now it appears he will face off with Mayweather on New Year’s Even in Japan as part of RIZIN 14.